(2).After registration, the system will automatically log you in. You can click the username on the upper right to enter the "Member Center", where you can view and edit your profile, or you can look directly for the items that you want to buy. (2) Fill in the item name or designated style number in the upper right search bar and click Search. (1) Browse for the items you are interested in. Enter the "Product Details" page to see the product description, fabric composition, available sizes, ID, price, store inventory, etc. Move your mouse over the images to zoom in. 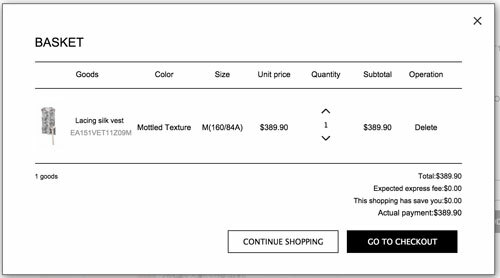 (2) Add to shopping cart: Click "Add to cart" on the "Product Details" page of the product you want to buy, and the product will be added to your shopping cart. (3) Click "Process order" to checkout immediately; or click "Shopping cart" on the upper right to enter your shopping cart, where you can delete items or change the number of items. After confirming the quantity, amount, price, and other information of the items, you can proceed to the checkout. a. For the first purchase, please correctly fill in the shipping information according to the prompts, or your items may not be successfully delivered. (1) In order to protect your shopping rights, please carefully check whether the package is in good condition, i.e. whether the seal is damaged or resealed, before signing the package and inspect the item together with the courier. 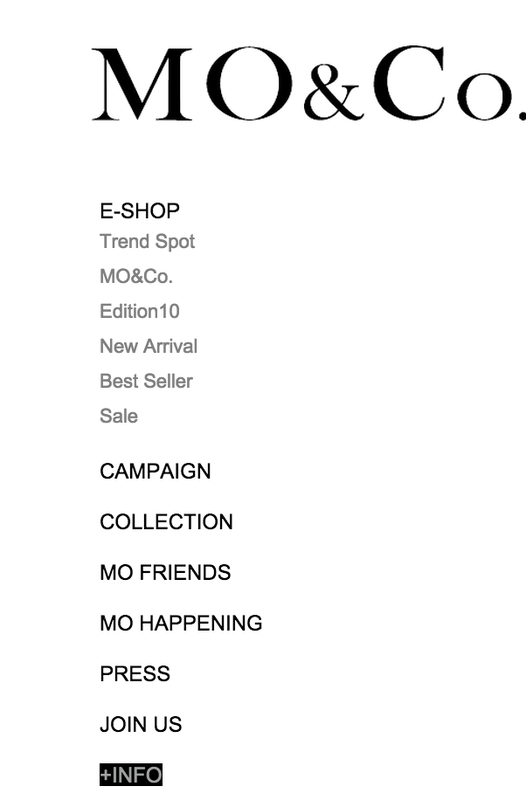 If any problem is found on the spot, please refuse to accept the item and send an email to eshop_us@mo-co.com. (2)If the item has any quality problems, please send an email to eshop_us@mo-co.com, or click "Contact" on the upper right of the website to contact us. (3)If the package is signed for you by someone else without objections, MO&Co. will deem that it is signed with your consent. a. After receiving your order, it generally takes five days before sending the goods and the time of arrival is subject to customs clearance and punctuality of the courier. We currently use FedEx for delivery by default. If you want to know more about the services or the scope of delivery of FedEx, please log in to the official website of FedEx for more information. Please note that customers are not allowed to designate an express company. Please check the order information carefully before payment, as the shipping information cannot be changed after sending out the goods. (3) Please ensure that the shipping address, zip code, telephone, email address and all other information are correct, so the items can be sent correctly and in a timely manner. You can view the latest order state from the "Order center" in your personal account. 1.How can I retrieve a forgotten password? Click the "Forgot your password?" link on the login page and fill in the registered email address. The system will then send an email to you. Click the link in the email to set a new password in the displayed page. 2.How do I know if the purchase has been completed? After placing an order, you will receive a confirmation email. If you didn't receive the email, please send an email to eshop_us@mo-co.com, or click "Contact" on the upper right of the website to contact us. 3.Can I see the status of the order? Please enter your personal center and select "Purchase history". You can view all orders by selecting "View order details". 4.Can I delete an item from the order? Yes, you can. As long as you haven't confirmed your order, you can delete any item from the shopping cart. 5.Can I cancel the order? Yes. You can cancel your order if the order status permits it. Please enter your "Personal center" to select the unpaid order and click "Cancel". You can't cancel an order that has already been paid. If you haven't registered, please click the "Order information" link in the confirmation email and click "Cancel the order". 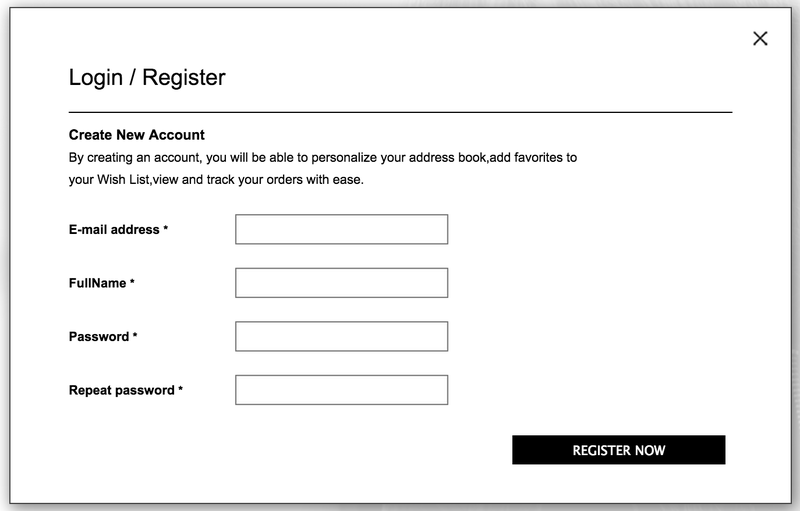 If you don’t register, please click the link “Order Information” in the confirm e-mail and then click “Cancel Order”. 6.What should I do if the item I received is damaged? MO&Co. only sells items in good condition. If the clothes you received are defective, please send an email to eshop_us@mo-co.com, or click "Contact" on the upper right of the website to contact us. 7.What should I do if the item I received is wrong? If the item you received is different from your order because of negligence, please send an email to eshop_us@mo-co.com, or click "Contact" on the upper right of the website to contact us. 8.Which languages can be used to view the website? Currently, the website can be viewed in: Chinese and English. 9. 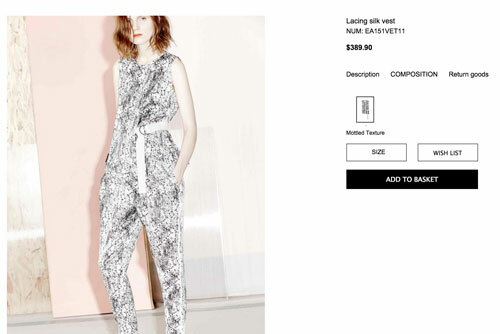 Is the price of the online shop the same as those in the physical store? Yes. If the price displayed on the website is different from the one on the clothing label, then the price on the clothing label in the country of purchase shall prevail. 10.Can I apply for fee adjustment refund service? Sorry, we don't provide fee adjustment refund. 11.Will you restock the items that are marked as "Out of stock"? If a product is out of stock, we will try to restock as soon as possible. If there is no stock, we will show "Product sold out" on the website. 12.Is the item I receive the same as that on the image? Yes, our items are 100% taken in kind. However, different displays may show slight color differences and some hand-made items may have slight differences. 13.Which payment method can I use? We only accept PayPal for now, and we will add UnionPay, JCB, Visa and MasterCard in the future. We don't support pay on delivery for now. We only support PayPal online payment and do not support pay on delivery for now. Please fill in the correct recipient's name, region, detailed address, zip code and contact number, so that we can delivery your items correctly. After completing the above information, please check whether the item quantity, color, size, amount and shipping address are correct and then click "Next" to enter the PayPal checkout page. After you successfully complete the paying process, we will send you an "Order confirmation" email to confirm that we accepted your order. （1）Within 7 days after signing for the order, you can apply for returning the items without any reason from the MO&Co. official website (Please note that if there is no quality problem, MO&Co. only gives a return service once for each order). Your application for returns after 7 days of signing will be rejected. a.The item shall be in same condition as at the time of signing, and it should be properly packed before sending, including the original tag, extra buttons, dustproof bag and hangers. Shoes and other accessories shall be returned in the original boxes. All items mentioned above shall not be damaged, used or modified in any way that will affect secondary sales. b.If you have received an invoice issued by the MO&Co. official website, you should also send back the invoice. If you fail to provide the invoice, your return will be rejected. 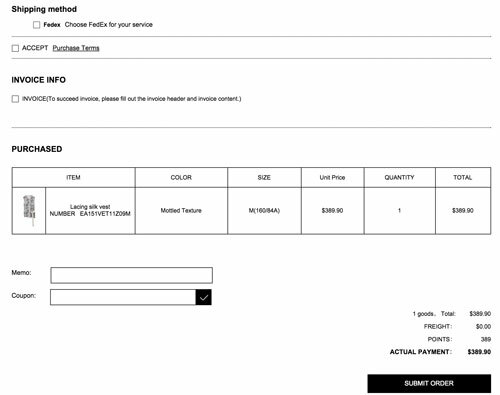 If you demanded an invoice when ordering but haven't received it yet, you do not need to send the invoice back. c.Special "package items" and "gift package items" cannot be partially returned, because the items inside the package will not be able to enjoy the discount when buying. d.Bargain items, discounted items or special offer items cannot be returned. e.Special items, including but not limited to underwear/underpants and socks, cannot be returned if there is no quality problem. f.Please do not use ordinary mail or unknown express services. a.For returns caused by a product quality problem, wrong items, or lack of items/accessories, the shipping fee shall be borne by the MO&Co. official website. Please use FedEX or another logistics company to send back the items through payment at destination. i The fabrics are different from what I expected: such as thickness, transparency, texture, etc. ii It does not fit me, it doesn’t look good when putting it on, it is different from my imagination, or the size, color or fabric is different from what I expected, etc. （3） When the order is confirmed to be returned, we will refund you according to the order payment , but you should bear delievery cost for returning, inbound and outbound customs clearance charges and other related expense. In addition, the shipping freight that we send the items to you is our logistic cost, so it cannot be refunded. a.Tiny defects: thread residue, painting traces, a few missed or skipped stitches, easy-to-handle small loose threads, loose buttons, small stains that do not affect wearing, non-obvious non-straight lines, occasional fallen hot fix rhinestones, tiny cracking of printing, unevenness or folds caused by transportation. b.Different displays may show a certain color difference between the images and the physical items. Application for a refund can be made only after completing an order, so please click "Confirm receipt" if you want to apply for a refund. The amount paid with points cannot be converted into cash and cannot be returned in cash. Please contact our customer service staff online before applying for a refund, otherwise your refund process will be delayed or even fail. c. When the warehouse receives your returned items, it will generally complete a quality inspection within 1-2 business days. After quality inspection and confirmation that the items conform to the return conditions, the MO&Co. official website will send a refund request to the financial department, which will refund the amount to your original payment account within 7 business days. After refunding, we will again send you an email. Please contact our online customer service staff before applying for a refund instead of applying without contacting them; otherwise your refund process will be delayed. c. After confirmation by both parties and completion of the refund process, we will unpack the package, inspect the items and make a registration within 2-5 business days, and then the refund amount will be returned to your original account. 2. If your order status is "Wait for delivery to claim a refund", please contact our online customer service staff first. Funds can be returned within 12 hours for non-delivered orders, while we will refuse your refund application if the items have already been delivered. In this case, please apply for refund according to the normal procedures after receiving items. Before applying for a refund, please first contact our online customer service, don't apply for a refund without contact, otherwise will affect your refund processing speed. c. After we both confirmed, and your refund process has been operated completed, money will be refund to your account generally within 2-5 working days after receipt of the goods and opening package for inspection and registration. 2.If, when apply for a refund, your order status is waiting for goods delivery, please first contact our online customer service, to determine whether the goods is send or not, generally the refund can be done within 12 hours, if the goods is send out, we will reject your refund application, you shall make refund application according to normal procedure after receiving goods. The online trading terms and conditions (hereinafter referred to as the "trading terms") apply to the use of this website and constitute the agreement between you and us. The trading terms stipulate the rights and obligations of all users (hereinafter referred to as "you") and us (hereinafter referred to as "we") in connection with items/services provided by us through this website or any other linked websites. Unless with our clear prior written consent, the trading terms are the only conditions that apply to the use of this website and substitute all other conditions. The trading terms are of great importance both to you and us. They are established to set up a legally binding agreement between you and us as well as to protect your rights as a consumer and our rights as an operator. You agree that you have read the trading terms and accept the terms and conditions contained therein if you place an order. 1. To only use this website for legitimate item inquiries or orders. 2. To refrain from making any speculative, false or fraudulent orders. If we have reason to believe that you have placed any of the aforementioned orders, we have the right to cancel the order and inform the relevant government departments. 4. 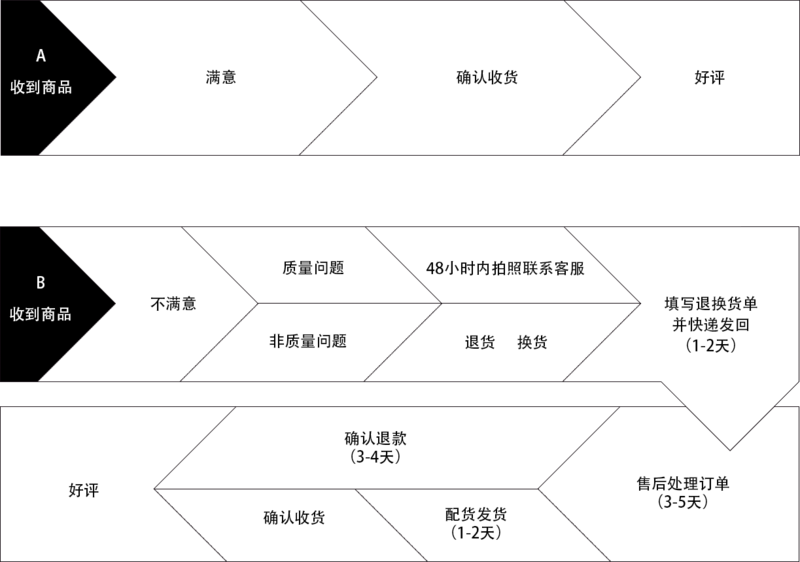 If you do not provide all the necessary information, we may fail to complete the order. To place an order through this website, you promise that you have reached the legal age to enter a legally binding contract required by Chinese law and you shall take full responsibility for the authenticity of all the information contained in the order. The range of items provided on our website applies to all places around the world. The information contained in the trading terms and details on the websites only constitute an invitation for an offer, and do not constitute an offer. Before we accept your order, there is no sales contract for any item between you and us. If we don't accept your order while the money has been deducted from your account, we will refund the full amount to your account. If you need to place an order to purchase an item, you should perform in accordance with the online shopping process and click "Confirm payment" to submit the order. Please note that although the payment may be deducted from your account, it doesn't mean that we have already accepted your order. Your order of buying one or more items only constitutes your invitation for an offer. The sales contract (hereinafter referred to as "the contract") between you and us will only be established after we send you an order delivery confirmation email. The contract only relates to the items we confirmed are shipped in the order delivery confirmation email. Unless any other items are confirmed shipped in another order delivery confirmation email, we have no obligation to provide such products even if they are part of your order. Before we send an order delivery confirmation email, all orders of items also depends on the inventory. If there are supply difficulties or no stock, we have the right to inform you to order substitute items of equal or higher quality and value. If you don't want to order such substitutes, we will refund you the full amount. We reserve the right to remove any items from the website and/or delete or edit any materials or content on the website. Although we will always try our best to handle all orders, there is still the possibility that we have to decline some orders even after sending an order confirmation email. In this case, we reserve the right to decline the order at our own discretion. We will assume no responsibility for you or any other third party in case we remove any items from our website, the items have been sold out, we delete or edit any material or content on our website, or we reject your order after we send you an order confirmation email. If you enter into a contract with us as a consumer, you can terminate the contract at any time within 30 days after we confirm that the order has been shipped. In case that you terminate the contract and the return conforms to our return policy (see article 13 below), you will receive the full refund for the already paid items. Your right to terminate the contract only applies to the items that are in the same condition as at the time of receiving the items. You should also return the product manual, attached documents and packaging materials. Any items damaged or not in same condition as at the time of receiving the item or beyond the scope of just opening the package cannot be returned. Therefore, you should take reasonable responsibility to take care of the items when keeping such items. You should take reasonable responsibility to take care of the items when keeping such items. Please keep the original package, manual/attached documents and packaging materials and return them together with the items. For further details and explanation of how to exercise these rights, please refer to the provisions in Article 13 of the trading terms, and the description in the order delivery confirmation email. Except for the restrictions of Article 5 or any other existing exceptional situations, we will do our best to fulfill your order within 15 business days after you pay for the order. o Items temporarily out of stock; o Restriction of delivery area; or o Inaccurate delivery information provided by you (for example, wrong delivery address). If we cannot complete the delivery on time for any reason, we will inform you and you have the right to choose either to extend the delivery date or to cancel the order and get the full payment back. We can arrange the delivery 365 days a year. According to the trading terms, if the items are received at the delivery address and there is evidence proving that the items have been received, the "delivery" is deemed to be completed or the items are deemed to be "delivered". If we are unable to deliver after trying three times, we will try to find a safe place to leave your package. We will leave you a notice and explain to you how to contact the courier and how to re-arrange the delivery. If you are not at the address of delivery on the specified time, please contact us to re-arrange another time and address that are convenient for both parties. Please note that the new address has to be in the same city as that of the original address. Once the items are delivered to the address appointed by you, you shall bear the risk of damage to and/or loss of the items. The ownership of the items shall only be transferred to you after we completely received all the payments including delivery cost, or after the delivery of the items (defined in Article 8 above) is completed (whichever occurred later shall prevail). MO&Co is charging only the price of commodities and freight. The other fees (such as customs charges and other related cost) depend on the actual situation should be borne by customers. Except in case of a manifest error, the price of items on the website shall prevail. Although we will try our best to ensure the accuracy of the prices on our website, mistakes and errors are always hard to avoid. If we notice any price mistake in the items you purchased, we will inform you as soon as possible. You can choose either to reconfirm the order or to cancel the order. If we are unable to contact you, the order will be automatically cancelled. Any amount that you have paid for the items will be refunded to you in full. Even if we have already sent you the order delivery confirmation email, we are entitled to not sell the items to you at the incorrect (lower) price if the price mistake is very obvious, unlikely to be misunderstood, and can be reasonably identified. The prices shown on our website include the value-added tax, but do not include delivery cost. The delivery cost will be added to the total amount according to the "Shipping Instructions". The prices are subject to change at any time, but the changes will not affect the orders which have been confirmed by order delivery confirmation email, except in situations such as the price mistakes mentioned above. 0. Click the "Shopping cart" button on top of the page. 1. Click the "Check shopping cart" button. 2. Click the "Process order" button. 3. 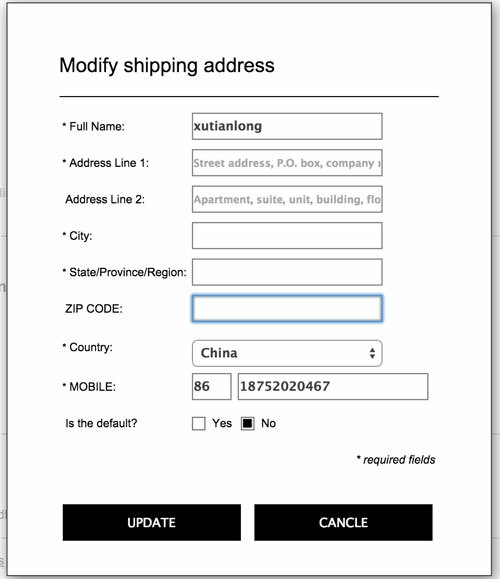 Fill in and confirm your contact information, order details, and delivery address. 4. Choose your preferred payment method and complete the payment process. You can pay through PayPal. In order to minimize the possibility of unauthorized usage of your bank card, the details of your bank card will be encrypted. If we do not receive your payment, we will not assume any responsibility for delayed delivery or non-delivery, and we will not enter into any contract with you. General policy: If you want to terminate the contract within the period prescribed in Article 7, you can choose to go to the mall to return the items, or choose to consign the items to the carrier we have arranged. You should send the items in the same package as the one at the time you received the items according to the "Returns" instructions on the website. If you have any questions, you can contact us through our website. You should send the Return Form (hereinafter referred to as the "Return Form") with all information filled in together with the returned items in the delivery package. Please return the original package, manual/attached documents and packaging materials together with the items. We will inform you whether you're entitled to obtain a refund after inspecting the items. We will handle your refund as soon as possible within 30 days after confirming that you are entitled to obtain a refund. We will refund the payment to the account you used for paying. Items that are in a different condition than the one at the time of receiving, or items used beyond just unpacking must not be returned. Exchange of items is limited to items of the same size and color. If you think the received item is inconsistent with the description in the contract, you should contact us immediately through our website and tell us the details and damage of the item. Also, you can contact us through the shopping mall, so we can give you guidance for returning your items. You can consign items to a carrier who handles transnational deliveries. After receiving the returned items, we will fully check the items and send you an email to inform you whether you are entitled to exchange the item or obtain a refund (if any) within a reasonable time. We will handle your refund or exchange as soon as possible within 30 days after us sending we sent you an email to confirm that you are entitled to obtain a refund or exchange of the non-conforming item. If the item is indeed defective, we will give you a full refund, including shipping and all necessary and reasonable costs caused by handling the return. We will always refund the payment to the account used for paying. These provisions do not affect your statutory rights under effective laws and regulations. Except where excluding or limiting our liabilities or attempt to exclude or limit our liabilities are illegal or against the law, we will only take responsibility for the items that you purchased through our website and limit our liability to the purchasing price of the items. 5. Wasting time of management or office. Due to the openness of our website and the possibility of errors during the storage and transfer of electronic information, we cannot promise the accuracy and safety of the information transferred to and gathered from our website, unless clearly stated on our website. All the item descriptions, information and data released on our website are according to the items' up-to-date conditions. There are no expressed, implied or any other forms of guarantee. Within the maximum extent permitted by law without ruling out any legal rights of consumers, we refuse to make any other forms of guarantee. Any content in this clause does not affect your statutory rights as a consumer or your legal right to terminate the contract. You acknowledge and agree that all copyright, trademarks and other intellectual property rights contained in all the information or content provided as a part of this website belong to us or our licensees at any time. You are only allowed to use the information in a clearly authorized way by us or our licensees. This provision does not prohibit you from making copies to make orders or making copies of contract details when necessary. Applicable laws require that some information or communication we send to you shall be made in written form. When you use our website, you accept that your communications with us will be mainly made in electronic form. We will contact you by email or provide information to you by publishing a notice on our website. For the purpose of the contract, you accept this way of electronic communication, and you acknowledge that all contracts, notices, information and other communications we provided to you electronically conform to the written form required by law. This provision does not affect your statutory rights. All notices sent to us should be given preferably via our website. Except as otherwise stated in Article 16 above, we can send notice to you through the email address or mailing address you gave us when placing an order. The notice is deemed as having been properly sent or received at the time when the notice is published on our website, or 24 hours after sending through email, or three days after sending in the form of a letter by mail. To prove the notice has been delivered, it will be sufficient to prove, in the case of a letter, that such letter was properly addressed, stamped and posted, and in the case of an email, that such e-mail was sent to the specified e-mail address of the addressee. The contract between you and us is binding for both parties and for their respective successors and assignees. You shall not transfer, assign or otherwise dispose of the contract, or any of your rights or obligations arising under it, without our prior written consent. We may transfer, assign, sub-contract or otherwise dispose of the contract, or any of our rights or obligations arising under it, at any time during the term of the contract. To avoid doubt, any such transfer, assignment, charge or other disposition will not affect your statutory rights as a consumer, or cancel, reduce or otherwise limit any warranty or guarantee which may have been provided by us to you, whether express or implied. We will not be liable or responsible in part or in whole for any failure to perform, or delay in performance of any of our obligations under a contract that is caused by events beyond our control (Force majeure). Force majeure refers to unforeseeable, unavoidable and insurmountable objective circumstances. If we fail, at any time during the term of a contract, to insist upon strict adherence to any of your obligations under the contract or any of the trading terms, or if we fail to exercise any of the rights or remedies to which we are entitled under the contract, this shall not constitute a waiver of such rights or remedies and shall not relieve you from compliance with such obligations. A waiver by us of for any breach of contract shall not constitute a waiver of any subsequent default breach of contract. No waiver by us of any of the trading terms shall be effective unless it is expressly stated to be a waiver and is communicated to you in writing in accordance with the provisions of the paragraph on Notices above. The trading terms and any document expressly referred to in them represent the entire agreement between you and us in relation to the subject matter of any contract and supersede any prior agreement, understanding or arrangement between you and us, whether oral or in writing. Both you and we acknowledge that, upon entering into this contract, neither you nor us have relied on any representation, undertaking or promise given by the other or be implied from anything said or written in negotiations between you and us prior to such contract except as expressly stated in the trading terms. Neither you nor we shall have any remedy in respect of any untrue statement made by the other, whether orally or in writing, prior to the date of any contract (unless such untrue statement was made fraudulently). The only remedy for either party after the contract between you and us is duly formed, shall be breach of contract as provided in the trading terms. Unless the misrepresentation is made in fraud way, you and we cannot get any relief because of any misrepresentation (whether oral or written) of the other party in prior to the date of contract. The only remedies of either party should be the liability for breach of contract under clause of article of this transaction after the formal contract between you and us. We have the right to revise and amend the trading terms from time to time which will be published on the website without serving further individual notice to you. The revisions and amendments to the trading terms shall automatically enter into force upon publication on the website. By using the website and/or placing an order through it following those revisions and amendments, you agree to be bound by the trading terms in force at any given time. If you do not agree to all of the trading terms in force at any given time, you shall not place an order. For this reason, you should always check the trading terms published on the website before placing any order. You shall be subject to the trading terms and other policies available on the website and in force at the time that you order items from us, unless any change to the trading terms or other policies is required to be made by law or governmental authority, in which case it will apply to orders previously placed. Contracts for the purchase of products through the website will be governed by Chinese law. Any dispute arising from or related to the aforementioned contract shall be subject to the non-exclusive jurisdiction of the competent Chinese courts where Guangzhou EPO Fashion Co., Ltd. is located. If you enter into the contract as a consumer, nothing in this clause will affect your statutory rights as a consumer. Feedback We welcome you to put forward your opinion and feedback. Please send us your feedback and opinion through our website. The trading terms are published and enter into force on August 1, 2014. 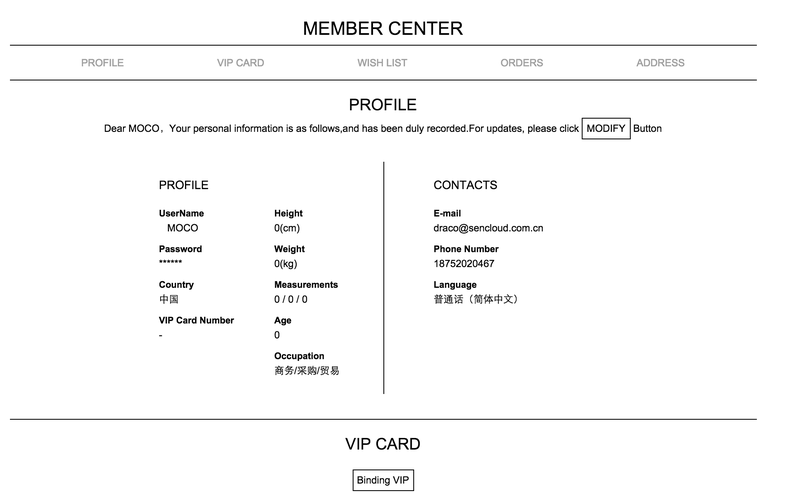 (1).If you aren’t registered customers, you will visit our websites as a visitor. However, if you make an order as a visitor, we would not collect or use your personal information, which may mean that you cannot enjoy any service or privilege given to our registered customers. (2).If you are not a registered user, you will be browsing our Website as a guest. We will not collect or use any personal data from you (except when you choose to place an order with us as a guest) but you may not be able to use all the services and features that we offer to registered users. (3). You will need to input certain personal data when registering with us on our Website, in order to enjoy various features and services that we offer to our registered users, such as email updates, responses to your queries, and participation in our private sales. (4).You can place an order with us on our Website as a guest or as a registered user. In both cases, we will only collect information necessary to fulfill the relevant order (such as your name, contact details and payment/credit card information). If, however, you log in using our social media feature, we will also collect information relating to your interests, circle of friends, and followers if you agree to share this information with us in order to use the features provided. (5).You may from time to time provide us with your personal data at our physical stores, via your applications for or use of various services that we provide. For instance, you may be required to provide us with your personal data when you apply for or use our VIP Card; to purchase from us or make enquiries at our stores or over the telephone; to use our concierge services; to provide us with feedback (such as via a survey); or to participate in our promotions and events (such as Private Sales). (6).You can also log into our Website using sign in services that bridge your social media login information with our Website. These services will authenticate your identity and provide you with the option to share certain personal data with us, such as your name and email address, to complete the registration form on our Website. These services give you the option to post information about your activities on the Website via your profile page to share with others within your personal network. (1) To provide our services to you (including assessing any application for and administration of such services). This includes responding to any questions you may have, providing you with recommendations on products in our stores or on our Website, maintaining your shopping cart on our Website, assessing your applications with us for any of our services, providing our VIP Card to you, allowing you to participate in our events and promotions when you so wish, and fulfilling any orders you may make with us (including verification and security checks of your details, and processing of your payments). (2) To provide you with direct marketing communications, in accordance with the “Marketing Communications” section below. (3) To analyze trends, usage and shopping behavior with us (whether on an individualized or aggregated basis), which helps us better understand how you and our collective customer base access and use our Website and services, for the purposes of improving our services and to respond to customer wishes and preferences. For these purposes, we will use personal data concerning your gender, age, interests, geographical location, Website usage, shopping behavior, and other personal data. If you do not provide us with your personal data, we may not be able to provide you with all of our services and features. Subject to, or where otherwise required by law or permitted by law to protect our interests, we will (a) only retain your personal data for as long as it is necessary to fulfill the Purposes, and (b) erase any of your personal data that we have stored as soon as reasonably practicable if you choose to delete your account with us, (c) erase your data held by a third party if you choose to delete your account with us, or stop using the social media features. We automatically collect data relating to your online session to provide our services to you, to gather statistical information on our server’s usage, and to help us better meet your demands and expectations. This may include but is not limited to your browser type and version, your operating system, and your IP address and/or domain name. We also use functionality that sets a unique identifier to track your use of our Website across multiple devices, so that your sessions are reported on our system as a single user rather than as multiple users. If you are browsing our Website (whether as a guest or as a registered user), it may place a cookie on your computer that identifies your computer to us and allows us to personalize your shopping experience and provide you with various services (such as maintaining the content of your shopping cart). Cookies are small information files stored on your hard drive and are automatically accepted by most browsers. It does not allow us to access the rest of your computer or your personal data. Please change your browser’s settings if you do not wish to accept cookies. Please note that you may not be able to use all features and services offered on our Website if your browser does not accept cookies. We may market to you our goods and services, and the goods and services of: (a) our related companies (including our affiliate and subsidiary companies), (b) joint venture partners, and (c) other third party providers. Such marketing communications may be in various forms, including advertisements, special events notifications or newsletters, and delivered via various methods in accordance with the personal data that you provide to us, such as by email, SMS, smartphone app push notifications, notifications on your social media pages, in-app messaging, or postal mails. Such marketing communications may market or offer products or services (including special events and promotions) in the following categories: Dining, food and beverages, sports, music, film, television and other entertainment, clothing and accessories, jewelry, luggage and bags, cosmetics, personal health and hygiene, electronics, home furnishings and housewares, automobiles, transport and travel, hotels, financial services, loyalty and reward programs, media services, entertainment services, social networking services, payment services, on-line advertising services, other e-commerce, information and communications and services, concierge services, and other products and services that we think may be relevant to you based on information you provide to us (for instance, via your participation in our surveys). You may partially or entirely opt-out of receiving such direct marketing communications at any time by: (a) amending your preferences in accordance with the “How to check and update your personal data” section below, (b) contacting our official website at eshop@mo-co.com or mail to: No.65, No.397 Xingang Middle Road, Haizhu District, Guangzhou, or MO&Co. 's official website, (c) in the case of emails, by clicking the “Unsubscribe” link at the bottom of such emails. We protect the personal data that you provide to us with reasonable physical, electronic and managerial measures. Please be aware that despite our efforts, no data security measures can guarantee 100% security at all times. • Any other party where such disclosure is mandated by statutory or contractual obligations, or where it is required by law or court of law, or where such disclosure is necessary to protect our interests (as permitted by law). We do not provide your personal data to any other third party, unless your prior express consent is obtained. We may transfer anonymous and aggregated data to third parties from time to time, which may include your personal data in an anonymous format and which does not allow the third parties to identify you in any way other than on our own Website. • Your real email address and/or contact number. • We may contact you to get more information about matters you declared. Thank you for helping us improving our protection of your personal information. We will reply to you within 15 days after receiving your declaration.